National Recycling Charity, RECOUP, have joined forces with Norfolk Waste Partnership with support from Marks & Spencer plc and RPC Group plc, to deliver a programme within Norfolk aimed at inspiring young people to recycle by demonstrating fashionable garments can be made from recycled plastic bottles. Nine finalists were selected from the Fashion Design Challenge competition set to schools and colleges in Norfolk area, in April 2018, to design fashionable garments that could be made from polyester which contained recycled PET bottles. The budding designers were then awarded textile to make up their garments with the opportunity to showcase their talent at Fashion Shows held on Saturday 9th June as part the One Planet Norwich Festival located at The Forum, Norwich. 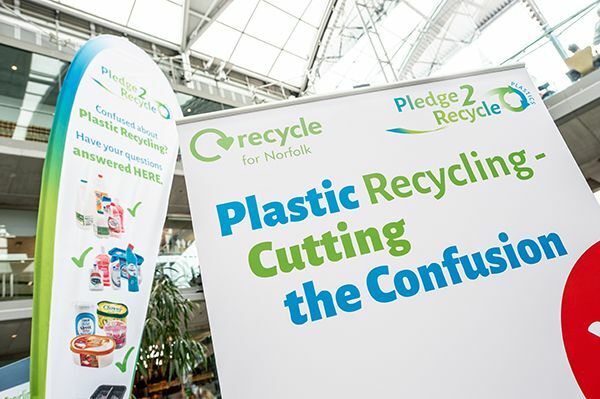 The Fashion Shows formed part of Recycle for Norfolk’s ‘Putting Recycled Plastic on the Catwalk!’ campaign, aimed at highlighting the many uses plastic can be put to when recycled. David Baker, Industry Affairs Director, RPC Group plc, said” We are delighted to be able to be involved with this project which highlights the versatility of plastics and the wide range of applications in which it can be used when it is recycled. Through recycling, the consumer can give our industry the opportunity to reuse this valuable resource”. RECOUP and representatives from each of the Waste Partnership’s Local Authorities travelled Norfolk visiting Cromer, Diss, Thetford, Great Yarmouth, Kings Lynn and Norwich to answer questions from householders on plastics recycling at the kerbside and to try to “Cut the Confusion” when it comes to plastic recycling. Householders were challenged to put a selection of plastics packaging into the right bin – “Recycling” or “General Waste” and householders were given a leaflet and fridge magnet as reminders. Plastic recycling experts from RECOUP were on hand throughout the roadshows to answer any individual questions on plastics recycling. The roadshow further emphasised how householders can ensure their plastic is truly recycled by keeping items clean, dry and loose in their recycling bins. Part of the encouragement to recycle included demonstrating to the householder how plastics packaging is recycled and the journey it might go through to become new useful products. Highlighting that recycled plastics is already in the high street drives home the message that, if put back into the system, recycled plastic can, and is being reborn. Foster added “This project provides a great opportunity to reduce confusion householders may have when recycling plastics and to ensure that the resource is recycled and does not end up as litter”.